As the name says, QFinder is a storage finder to locate storage arrays in the local area network. It really comes in handy when you set up a storage system for the very first time. If you forget the management port IP address, you can always count on QFinder to find out and connect to the target for you. QFinder is a Java-based tool as well. It has cross-platform capability. You can run QFinder on Windows, Mac, and Linux operating systems. And of course, QFinder can only locate QSAN storage systems. It will not locate storage systems of other brands on the network. 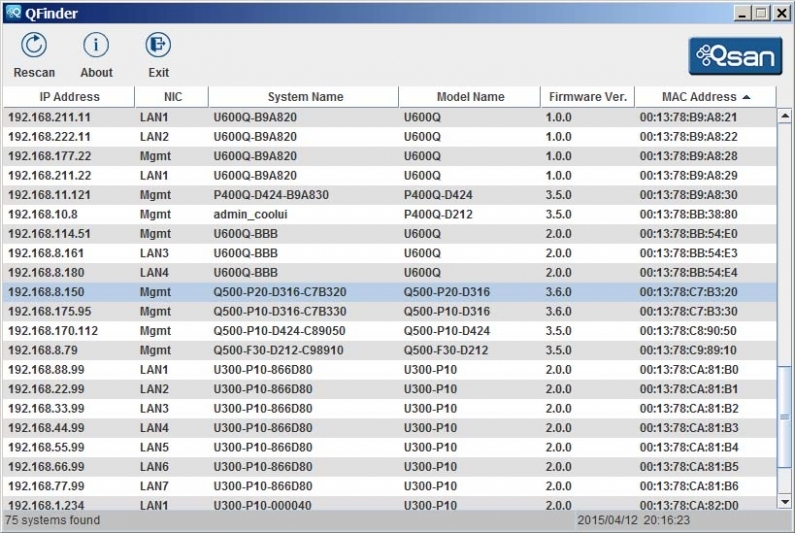 QFinder will display a list of QSAN storage systems available on the network with important information such as system name, IP address, model name, and firmware version. Based on this information, you can easily locate the machine you are about to find. By simply double clicking on the seleted machine, it will automatically bring up your default web browser and connect to the web UI for you.